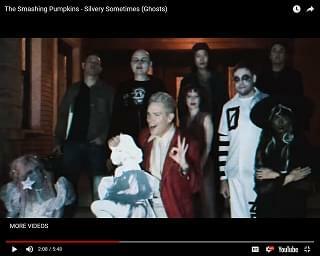 Smashing Pumpkins have released a new music video for the track “Silvery Sometimes (Ghosts)” from their upcoming album “Shiny and Oh So Bright, Vol. 1 / LP: No Past. No Future. No Sun.” With October coming to a close, the video is fittingly Halloween-themed. Directed and written by frontman Billy Corgan, the spooky visual features the band spending the night at a haunted house for a radio promotion. The radio station’s host is played by Sugar Ray’s Mark McGrath. The band’s new album drops on November 16th and is available to pre-order HERE.